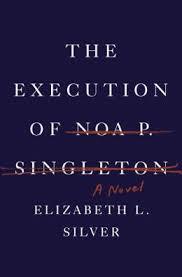 THE EXECUTION OF NOA P. SINGLETON: A Novel by astounding new voice Elizabeth L. Silver is a clever, gripping and psychologically astute debut novel about a young woman on death row, what she did to get there, and why she may never share the truth with a living soul. It is unapologetic, unpredictable, and unforgettable. THE EXECUTION OF NOA P. SINGLETON begins with Noa’s imminent death in a Pennsylvania penitentiary. Incarcerated at the age of twenty-five for the murder of Sarah Dixon and having served ten years with little hope for appeal, Noa Singleton (prisoner No. 10271978) is ready to die. Yet, six months before her execution date, she has an unexpected visitor, high-powered attorney Marlene Dixon. Marlene, the mother of Noa’s victim, has initiated a clemency petition on Noa’s behalf. But why would Marlene change her mind, and what does she want from Noa? As Noa’s prison memoir unfolds, we learn about the events leading up to Sarah’s murder, as well as the links binding Noa, Sarah, and Marlene’s fates. Interspersed throughout the novel are Marlene’s confessional letters to her daughter that reveal clues exposing a past filled with love, anguish, and deception. But which story is sincere? As Noa’s execution date looms large, we are faced with truths just as sinister as the crime of which she has been accused. THE EXECUTION OF NOA P. SINGLETON is a fierce and haunting first novel that will leave you thinking about the legal system long after you’ve read the final page. Wow. I am utterly amazed by this book. It had my mind working every which way and turned my emotions upside down and all around. The Execution of Noa P. Singleton is definitely a book that I won't be forgetting. In fact, its been weeks since I've read it and I'm still thinking about Noa. She's a character that haunts you and her story is one that will leave you feeling sad, angry and a bit discomfited by all that you have read. This is one book that I will definitely be recommending to everyone I know! Okay, so what made me love this book? It wasn't learning about death row, I'll tell you that much. It was the excellent writing that had me wondering so many things all at once. I loved how this book had me questioning the characters' motives, stories, and outcomes. I found myself gripping the book tighter and tighter the more I learned about Noa and her past. There were so many heavy issues that were raised within the story that I couldn't help but feel overwhelmed and exhausted by them all. I found myself gasping aloud, cringing in horror, and wondering how awful people like this could even exist. I had to remind myself that I was reading a fictitious story, because it felt so real - like something you hear about on the news. And these characters actions - oh my! They were just so horrible, so wrong, and they didn't even seem to really understand how responsible they were for so much of what happened. The more ugly it got, the more real it felt, which is scary. But I couldn't stop reading. I kept right on turning page after page, because I had to know if Noa would ever reveal why she murdered Sarah. Suffice it to say, I was shocked by what I learned. And that is precisely why I loved this book - the writing, the shocking truth, and the fascinating character of Noa P. Singleton combined to make one unforgettable read. In fact, it was such a captivating read that I phoned in sick to work, just so that I could finish reading it - believe me, it was worth it. So, I'll make sure to warn everyone I recommend this book to how unputdownable it really is. GIVEAWAY: Thanks to the publisher I have one copy of this fantastic book to give away!! All you have to do is leave me a comment - don't forget to include your email address (in case you win, I need to contact you). US residents only. Last day to enter is June 30th. Good luck!! Thank you to TLC Book Tours and the publisher for providing me with a copy of this book! I have been intrigued by this book ever since I saw it on the TLC blog. Sounds awesome! Thanks for running this giveaway. This book looks interesting! Thanks so much for the giveaway. This book quickly made it onto my Wish List. Please count me in. Thank you! I love it when a book takes you all over the place but does it skillfully. Sounds like this one is well done. Sounds good. There is something special about excellent first novels. I've read so many good reviews of this book. I also have to check TLC's other stop on the tour. I've only heard good things about this book and I trust your judgement! This book really sounds interesting lomazowr@gmail.com. The synopsis sounds fantastic! But-your review now makes it a must-read for me!! I loved your review and appreciate the opportunity to read the book :D Booksintheburbs(at)gmail(dot)com. I love that you called in to work so you could stay home and read this one! Good luck to you all with the giveaway - believe me, you want to read this one! !